We have been very productive in our household so far this year. Mr. Helpful attacked his side of our closet. I would say his half, but that would be a lie. Our "sides" are not exactly even. Guilty. Typical, though, right? Women just have more clothes. He emerged with 2 large trash bags full of clothes to donate. He even threw some clothes away, that were not worthy of donating. I could not believe the transformation when I walked in there and saw his side. Wish I had a before picture. Then I saw my side. Oh. Not so good. You know those pictures of people who've had half their face treated with some amazing product and the other side looks horrible? That was our closet. Ok, here goes. I'm holding my breath and closing my eyes as you look at this. Me being "Miss Organized" could not be outdone. I had to tackle my side, which I have successfully avoided since we moved in a year and a half ago. See the moving box? Not sure what's down in there, but obviously, I don't need it if it's been sitting there since July 2010. I have several formal dresses from my skinnier days. Days when I had a reason to actually wear a formal dress from time to time. Business suits from my "real job" days - eight years ago. Bridesmaid dresses, outdated skirts, pants that are too big or too small, shoes that don't fit my post-kid feet, my wedding dress, my guitar (which hasn't been played in at least seven years), and... ugh, I need to stop. It's giving me a headache. Mr. Helpful agreed to take the kids for the afternoon and I went to work. My method of purging/reorganizing is to make a really big mess first, and start over. I went through the hanging clothes first, and made a donate pile. Or tower, as it turned out to be. If I've had it since before kids, it's gone. Sadly, I've had some things for much much longer than that. If I haven't worn it, or make a face every time I see it hanging there, it's gone. Next I threw (literally) all the clothes on the shelves down onto the floor. I've got to be honest, there was something very therapeutic about that. I highly recommend it. Things that were staying got neatly folded and placed (not thrown) in neat stacks back on the shelves. The rest were thrown on the donate tower. A few of my donate clothes are actually quite nice - Ann Taylor, Eddie Bauer. (That's nice to me, a Target, Khols, & Old Navy kind of gal.) So I placed them aside in a laundry basket to see if I can find a place to consign them. I may do that with some of my nicer formal dresses and timeless suits as well. Hey, if I can make a few bucks, it's as if someone paid me to clean out my closet. Score. I recently spent some time in my studio (a.k.a. our dining room) taking inventory, which is another way of saying it was such a mess I had no idea what I had in there. Now it's organized. I have a lot of ribbon. I'm a recovering ribbon addict. I fully admit to buying ribbon on sale with no specific project in mind. I can't stop myself when ribbon is on sale. (Help.) 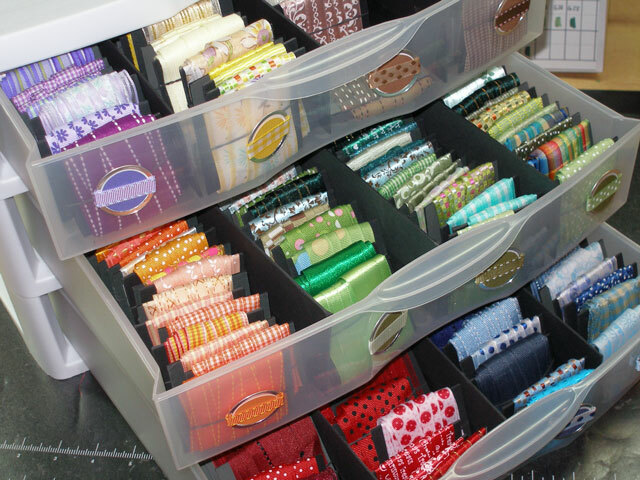 There are tons of different ways to organize ribbon - some would work for me, some would not. The system I use seems to be working, so I'm not going to mess with it. Nothing fancy. Just plastic shoebox size bins, somewhat sorted by color. I use a pin to hold the end in so the spool doesn't unravel. Ribbon gets used to make hair bows and headbands, mostly. Occasionally I'll use some to tie a label or tag on something, if I'm trying to be all "Martha". I do sell these headbands and/or hairbows (though I don't have the bows pictured). Headbands are $7. Bows range from $3-5, plus shipping. If you're interested, contact me, and we can figure out colors. They make very nice gifts and can be custom made to match outfits, holidays, etc. Recently, as we were getting the kids out the door for school, searching through the closet for the appropriate coats, matching gloves, etc., Mr. Helpful says to me, "That closet needs help." Yes, yes it does. So The Bear and I went to work. Here is the closet before. Contents include games, dog towels, winter hats & gloves, summer hats & caps, a bin of school stuff for each kid, rolling drawers of stationary and extra office supplies, coats for all seasons for five people, bathroom hand towels, four folding tables, four folding chairs, and an overflowing basket of tablecloths that we don't use. Because that makes sense, right? It might help to tell you that this closet is between our powder room and our family room/kitchen area. Not by an entryway. And though we live in the south, we originate from the north, so we do believe in wearing coats unlike many southern natives. First step - empty contents and vacuum. Next, sort into keep, purge, and relocate piles. Refold dog towels and tablecloths. Rehang coats. Label. I had a special helper. She was not tired, just an actress who wanted to get in my pictures! Those vinyl tablecloths are usually for outside parties or messy crafts, but they don't stay folded well. So I put a rubber band around them to hold the fold. The kids coats that are worn most hang from hooks on the door, so they can reach them. I had an empty bin that worked for my Christmas tablecloths. Two of them are round. Do I have a round table? Not anymore. But I do have an idea for a tree skirt, so I'm going to hang onto them. I promise that if I don't use any of these after next Christmas, they're out. Yes, they are tablecloths, but that's also "free" fabric. That's how I see it. Hmm. I'm not loving that white basket thing on top, but it's an improvement. It's too wide to fit on the shelf itself. When I reorg the kitchen, maybe the tablecloths can find a new home in there. The coats aren't as scrunched. I actually may be able to purge a couple more, but I need Mr. Helpful to decide, since they're his. Summer hats and adult winter gear have their own bin. Kid winter gear is in a bin on the floor so they can reach it. I have a better idea, but that is another post. The folding chairs are leaning against the left side, with the tables along the back of the closet. At the start of every new year people make resolutions and have motivation to succeed at least for a day or two. Maybe even a week or a month. My personal resolutions usually involve losing weight or getting in shape, etc. Blah blah blah. Well, this year, I'm not going there. Not that I don't need to do those things. But I just don't want to announce it publicly. So if I chow down on leftover Christmas cookies, or the bottomless fries at Red Robin from time to time, I will not be judged or reminded of my failure. Just being real. One of my goals this year is to UWIH. Use What I Have. For example, I have a ton of hand lotion. Why does one need more than one bottle of hand lotion at a time? Well, I don't anyway. So this year, I am not going to purchase any hand lotion until I UWIH down to the last drop. This picture does not include the lotions I have in my purse and my car. It's just taking up space. I also have more perfume/body spray than I need. Mostly gifts. I admit - I have perfume that I got in high school from a high school boyfriend. Probably should throw that out. Does perfume expire? Anyway, I don't wear it much - or not often enough according to Mr. Helpful. But maybe I should. I have it. Just sitting in a basket in my bathroom closet. Why not? If I'm not going to wear it, I need to get rid of it. Cleaning supplies is another area where I aspire to UWIH. So instead of buying a new scent of bathroom cleaner, I am going to use up the Costco size Comet I have in my stock of cleaning agents. I have a ton of Windex - we bought a big refill bottle probably 5 years ago. Guess I need to wash my windows more often. Oh how I wish this picture was all I had. But there is about that much under my kitchen sink as well. And more in the mudroom closet. And the hall closet. The big one for me is knitting, sewing, and crafting supplies. You can never have too much, right? But if I don't use it, it's just sitting there. I really enjoy doing those things! I'm not trying to start a collection of yarn. I've bought yarn over the years with good intentions but very little time. Again, I have more yarn in another basket downstairs. And more in my knitting bag. Ugh, this is embarrassing. With that said, I'm going to pick up my knitting needles and start. Something. Probably a dish cloth, because they are easy and functional and make nice gifts. I am going to attempt to update you monthly on my progress. Hopefully my stash of lotion, perfume, cleaning products, and yarn will decrease, creating more space and less clutter. Use. Purge. Simplify. Succeed. Who's with me? !